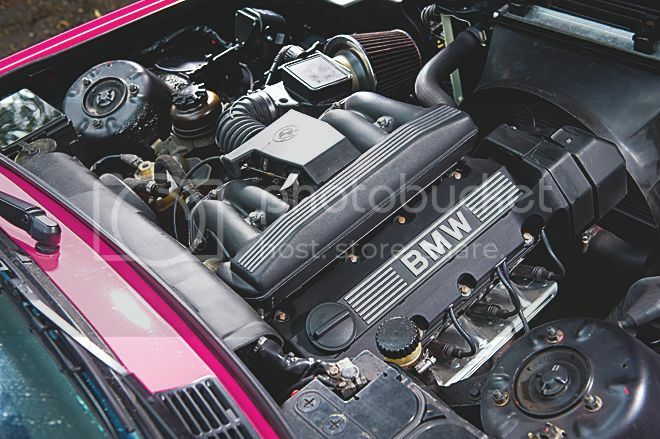 Fully rebuilt M40 4-cylinder 316 engine, with all new water hoses, gaskets, & radiator. Engine removed and sprayed enamel satin black. Rocker cover, air intake manifold, and oil filter cap sprayed enamel satin black, with polished highlights. K&N polished air filter. New alternator & brake servo sprayed enamel satin black. Inner body wings sprayed normal satin black to give black on black contrast. Water bottle sprayed satin black. Mirrored fuse box lid cover on satin black fuse box lid. Wing mounting bolts replaced with black items. New bonnet seals. New black under bonnet foam protection. Full stainless steel Powerflow exhaust. Standard 5-speed manual gearbox & diff. New Fuel tank. 17 x 7.5J ET37 Keskin KT5 (Front) with 20mm Spacers & extended wheel bolts fitted with 195/40/17 Kumho Ecsta tyres, 17 x 9J ET25 Keskin KT5 (Rear) with 15mm Spacers & extended wheel bolts fitted with 205/40/17 Infinity tyres. 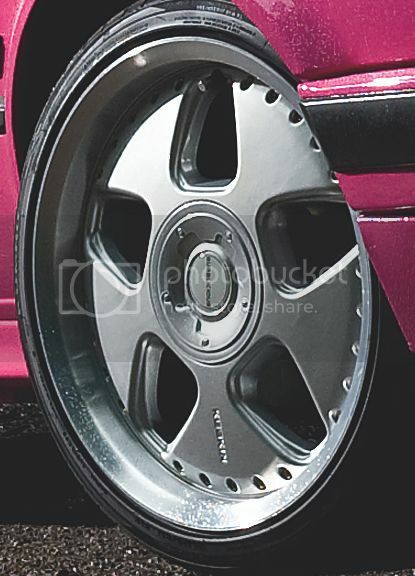 “Bubblicious” wheel centre badges. Front 60mm Jamex springs, standard shocks, Rear 40mm Spax springs with standard shocks. Upgraded bushes. Brakes upgraded to Brembo max discs with Tarox pads all round. 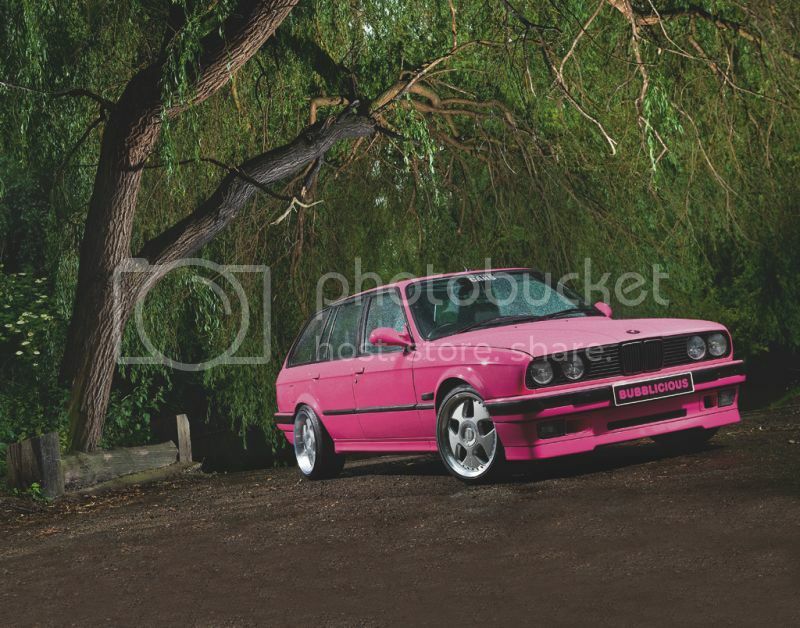 Standard 320i body kit, fully resprayed in one-off Custom Cars Pink. Rolled and flared front and rear wheel arches. 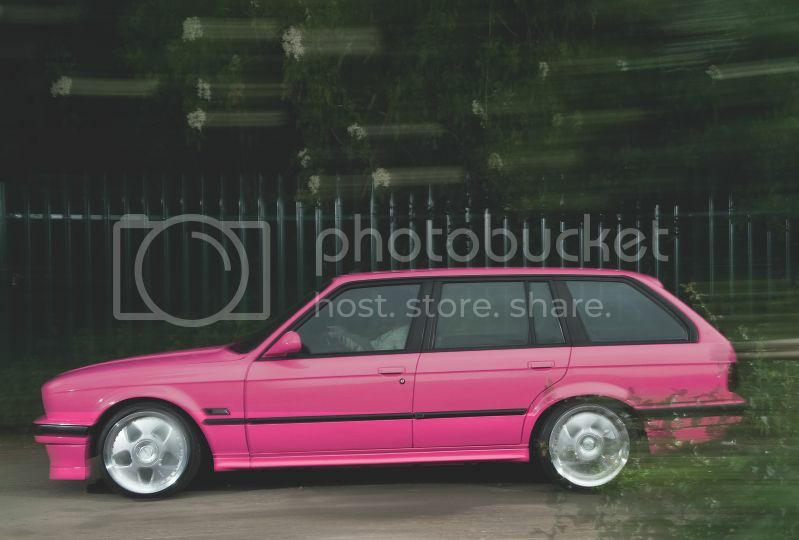 Colour coded door handles and boot roof spoiler. Colour coded IS front splitter. 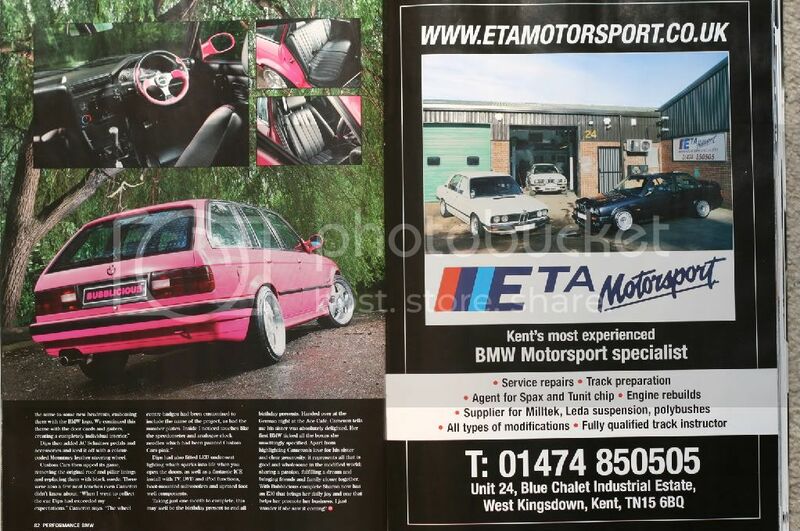 Electric E36 M3 style side mirrors specifically designed for the E30, spring loaded, colour coded Pink. Window trims, front kidney grilles, and rubbing strips sprayed satin black. Smoked headlights, front and side indicators. Smoked rear lights. New front foglights. Custom colour coded bonnet & boot badges. Satin blacked ariel. New sunroof seals. 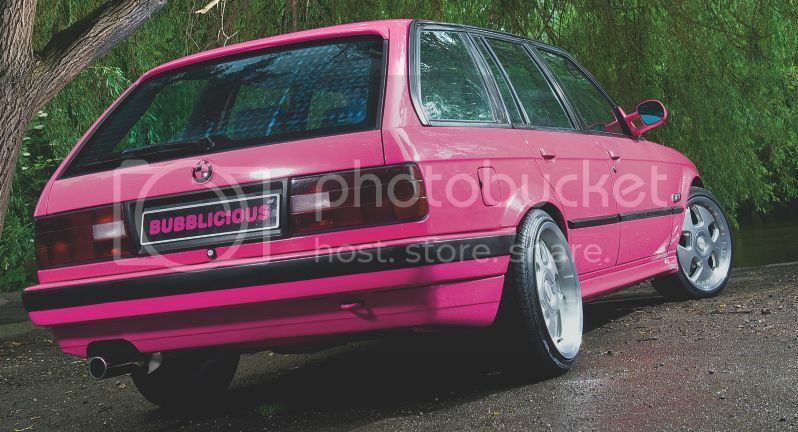 New numberplates with “Bubblicious” slogan & black “Bubblicious” show plates. 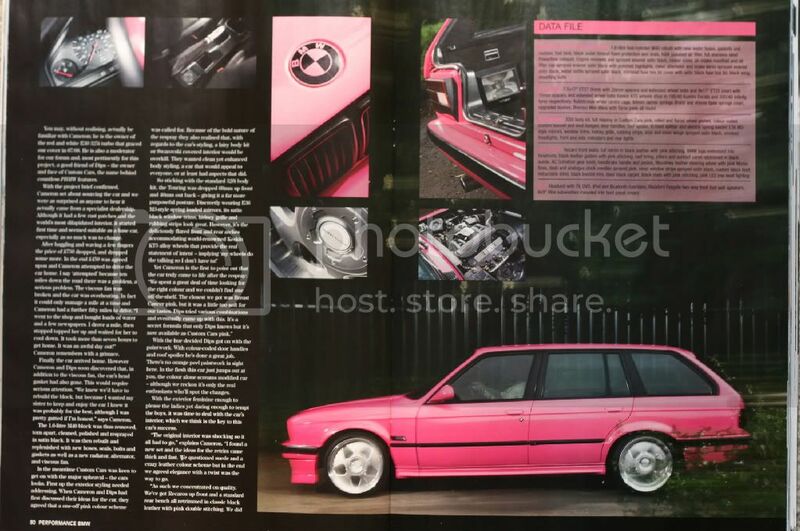 Retrimmed Recaro front seats in black leather with pink stitching. BMW logo embossed into leather trimmed headrests. Standard rear seats retrimmed in black leather with pink stitching. 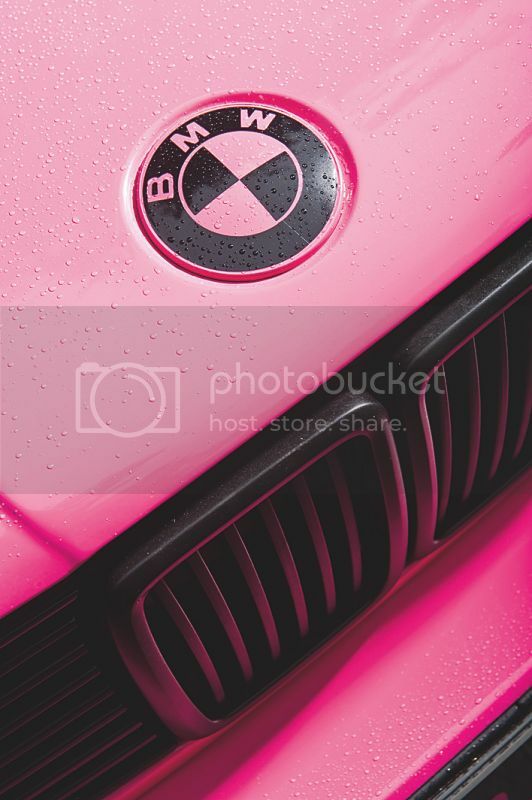 Headrests added & trimmed in black leather with pink stitching and BMW logo embossed. Beige carpet removed and replaced with grey and then dyed black along with boot floor and side wall carpets. Original roof lining removed and retrimmed with black suede, along with A, B, C, & D pillars and sunroof panel. Pink LED low level lighting. Black carpet mats with pink stitching. Black leather handbrake & gear stick gaiters with pink stitching. AC Schnitzer gear knob, handbrake handle and 3-piece manual pedal set. 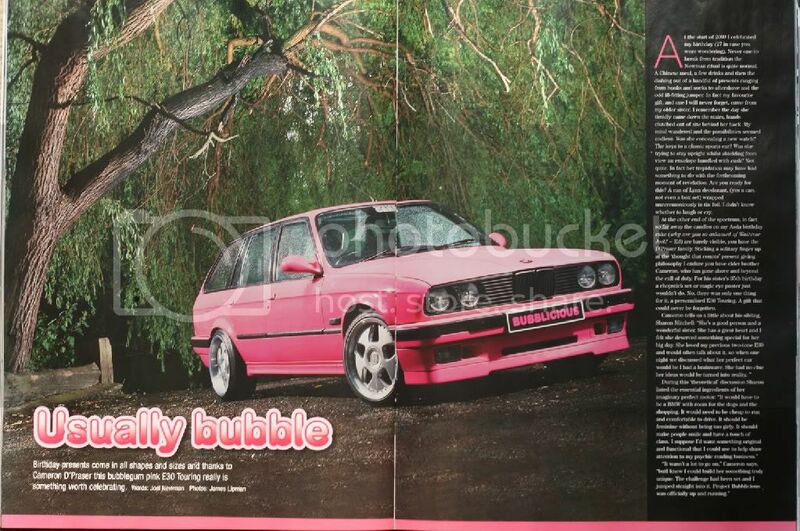 Original door cards retrimmed with black leather and pink stitching. Inner window strips sprayed satin black. Boot retractable blind replaced with custom black item. Dash clocks & analogue clock removed taken apart to colour code the needles Pink. Custom made “Bubblicious” keying. Mountney leather steering wheel colour coded Pink and fitted to a Momo boss. Beige boot lid trim replaced with black items. Unbranded head unit with TV, DVD, IPOD, & Bluetooth functions. Microphone located on Driver’s A-pillar. 6x9 Vibe subwoofers mounted into boot panel covers. Front foot well speakers upgraded to Rockford Fosgate 5 ¼ inch 2-ways. Thatcham approved CAT 1 alarm & immobilizer.